It's hard to believe that we're only under a month away from Captain America: Civil War being released into theaters. With the film boasting sequences filmed with state-of-the-art IMAX cameras, fans are already wondering which pieces of the film will loom the largest in the already gargantuan format. Well, we've got our answer from the Russo Brothers themselves, as they've revealed that "the airport scene" is the one that's going to pop the most eyes in your IMAX auditorium. That sequence we figured deserved that scope, that scale of frame, you know?. We also have a lot of characters who fly in that sequence -- there's a lot of vertical movement in that sequence -- and so the added dimension of that IMAX frame really helps us sell the action on that axis. Another interesting detail about why Joe and Anthony Russo decided to use the airport sequence as the IMAX cherry to the sundae that is Captain America: Civil War is the fact that they see this scene as their film's big "splash panel." So when Tony Stark and Steve Rogers' respective forces run towards each other on the large format screen, the effect will be akin to transitioning from a standard four-panel format to one, huge image. An image that, according to the Russo Brothers themselves, is a 17 minutes long sequence. While that might not be a record for IMAX films in general, it's the most sustained sequence of full-frame treatment that we can think of in recent Marvel Studios history. It's rather fitting that Captain America: Civil War would get this sort of treatment too, as it's a film that has a lot riding on it. With Phase 3 of the Marvel Cinematic Universe kicking off with the super-hero themed geopolitical thriller, the quality of both the story and spectacle of the third Captain America is already on a pretty high pedestal. So naturally, the bar needs to be cleared, and if Captain America: Civil War is going to wow the crowd, then a huge 17 minute IMAX sequence is certainly going to go a long way towards closing the deal. 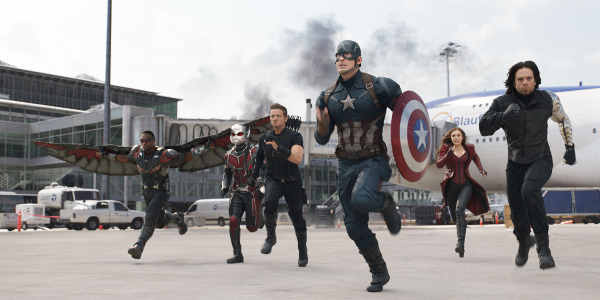 Captain America: Civil War will be in conventional and IMAX theaters on May 5, 2016. Though stay tuned for some exclusive footage dropping during tonight's MTV Movie Awards.